Microorganisms are present everywhere and are very versatile in all ecosystems around the globe. Studies demonstrated that 1% of all bacterial species and less than 5% of fungal species are currently known, and at least 10 million microbial species are unknown, remaining hidden in nature . The marine environment is a huge untapped reservoir for fungal diversity. Jones et al. estimated that there could be up to 10,000 species of marine fungi and currently more than 1100 species are documented . These fungi have a wide distribution and recently a number of new species have been discovered [4, 5, 6, 7]. Endophytes, a term introduced in 1866, are microorganisms that reside inter- and intracellularly in plants without causing harm to their host cells [8, 9, 10, 11]. Endophytic fungi have been found in every plant species examined, and it is estimated that there are over one million endophytic fungi [12, 13, 14, 15, 16]. Interest in endophytes has increased immensely with the discovery of the endophytic fungus Taxomyces andreanae, from Taxus brevifolia, producing the billion dollar anticancer drug paclitaxel (taxol), a diterpinoid used in the treatment of breast and ovarian cancers. However, the industrial-scale production of taxol, although being a promising drug, is not meeting the demand of the world population with respect to the number of cancer patients dying from the disease. According to the World Health Organization , between 2008 and 2030, the number of new cancer cases is expected to increase more than 80% in low-income countries, which is twice the rate expected in high-income countries (40%). This alarming fact posits scientists to explore new possibilities to synthesize the compound (taxol) from other sources. Many Taxus species are recognized as good taxol producers, namely, T. baccata, T. chinensis, T. cuspidata, T. media, T. floridana, T. canadensis, T. yunnanensis, T. mairei, T. sumatrana, and T. wallichiana . Interestingly, many non-Taxus species also yield taxol compound such as Cardiospermum halicacabum, Citrus medica, Cupressus sp., Ginkgo biloba, Hibiscus rosa-sinensis, Taxodium distichum, Podocarpus sp., Torreya grandifolia, Terminalia arjuna, and Wollemia nobilis . Indeed, till date it has been found that taxol can be produced by some other endophytic fungi, namely, Metarhizium anisopliae and Cladosporium cladosporioides MD2 producing the compound of interest up to a level of 800 μg/L . Recently, a study conducted by El-Sayed et al. (2018) has demonstrated that fungal endophytes, Aspergillus terreus EFB108, EFB59, and EFB14 isolated from the leaves and twigs of Podocarpus gracilior cork are potent taxol producers . Moreover, El-Maali et al. (2018) proposed a faster and accurate isolation method of taxol from two endophytic fungi, namely, Clasdosporium sphaerospermum and Metarizium anisoplae yielding up to 30.36 and 116.373 μg/L, respectively . More than two decades have elapsed since the notable ground breaking discovery of taxol happened, but importantly numerous bioactive molecules have also been isolated from various endophytic fungi [8, 23]. However, only a handful have been described, which means the opportunity to find new and targeted natural products from endophytic microorganisms in different niches and ecosystems is boundless  and fungi can be easily grown under routine culture techniques and hence the potential for discovering a virtually inexhaustible supply of metabolites is high. Additionally, modification of culture conditions alters biosynthetic pathways thus leading to the possibility of producing more novel derivatives . Since endophytes are capable of producing compounds similar to their host plants, research on endophytes can help in the preservation of world’s diminishing biodiversity . Endophytic fungi comprise a highly diverse ecological and taxonomic group. An ecosystem having the greatest biodiversity is the one with the greatest number of endophytes and the most diverse microorganisms [26, 27, 28]. Tropical and temperate forests are considered to be the most diverse terrestrial ecosystems, with the greatest number and diversity of endophytic fungi since the plants residing in these regions are in a constant evolutionary race to survive [29, 30, 31, 32]. For instance, the isolation of 418 endophyte morphospecies from 83 healthy leaves of Heisteria concinna and Ouratea lucens found in the tropical forest of central Panama demonstrated high diversity in these regions. High diversity is associated with the ability of endophytic fungi to cope efficiently with environmental conditions due to exchange of information between them and the higher plant [31, 33]. The oceans, specifically deep-sea hydrothermal vents, mangrove forests, algae, and sponges, have recently been discovered to be an ecological niche with high diversity of endophytes [29, 34, 35]. Endophytes are also widely distributed in marine sources especially in sponges and algae with a higher ratio of new compounds to known compounds from algicolous fungi (3.1:1) as compared to sponge-derived fungi (1.4:1) [30, 36, 37, 38]. Endophytic fungi are therefore detected in all plants such as algae, mosses, ferns, and numerous angiosperms and gymnosperms including plants from tropical, temperate, and boreal forests, as well as those from extreme arctic, alpine, and xeric environments [36, 39]. Taxonomically, most of the endophytic fungi belong to the phylum Ascomycota and its associated anamorphs, while some species belong to the phyla Basidiomycota and Zygomycota . The majority of these isolates belonged to ubiquitous genera (e.g., Acremonium, Alternaria, Cladosporium, Coniothyrium, Epicoccum, Fusarium, Geniculosporium, Phoma, and Pleospora), but some genera are common in both tropical and temperate climates (e.g., Fusarium, Phomopsis, and Phoma) while members of the Xylariaceace, Colletotrichum, Phyllosticta, and Pestalotiopsis predominate as endophytes in the tropics [33, 40]. Endophytic fungi open a new avenue for the quest of biologically active secondary metabolites. 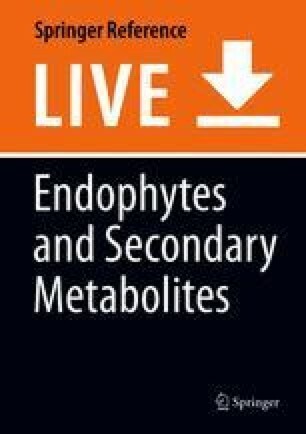 Various prominent and novel secondary metabolites from various phytochemical classes have been derived from endophytic fungi, namely, alkaloids, terpenoids, steroids, lactones, phenols, and isocoumarins among others . In the past two decades, many valuable bioactive compounds with antimicrobial, antioxidant, antiviral, cytotoxic, immunosuppressive, and anticancer activities have been successfully discovered from the endophytic fungi [42, 43, 44]. Metabolites produced by endophytic fungi usually originate from biosynthetic pathways and include isoprenoid, polyketide, and amino acid and belong to structural groups, such as terpenoids, steroids, xanthones, quinines, phenols, isocoumarins, benzopyranones, tetralones, cytochalasins, and enniatins [45, 46]. The major supply of paclitaxel, a well-known and highly functionalized tetracyclic diterpenoid bioactive compound used as anticancer agent, from wild Taxus plants was problematic as it was unable to satisfy the growing demand of the market since they were produced in minute amount in these plants . The promising approach to eradicate this problem was the successful discovery of a paclitaxel producing endophytic fungus Taxomyces andreanae isolated from the Pacific yew Taxus brevifolia in 1993. There are nowadays at least 19 genera of endophytic fungi (that is, Alternaria, Aspergillus, Botryodiplodia, Botrytis, Cladosporium, Ectostroma, Fusarium, Metarhizium, Monochaetia, Mucor, Ozonium, Papulaspora, Periconia, Pestalotia, Pestalotiopsis, Phyllosticta, Pithomyces, Taxomyces, and Tubercularia) which are capable of producing paclitaxel and its analogues, for instance, 10-deacetylbaccatin III and baccatin III among others [47, 48, 49]. Lovastatin, a potent inhibitor of HMG-CoA reductase enzyme used as lipid lowering agent was produced as secondary metabolite by the fungi Penicillium sp., Monascus ruber, and Aspergillus terreus. It was recently found to be produced by the endophytic fungus Aspergillus niger which was isolated from the healthy tissues of Taxus baccata . Another anticancer drug podophyllotoxin, an aryl tetralin lignin derivative, most commonly isolated from Sinopodophyllum plants show good antiviral and cytotoxic activities . The fungus Fusarium oxysporum, isolated from the plant Juniperus recurva, produced the compound Podophyllotoxin up to a level of 28 μg/g of dry mass and showing activity in U-87 cell line . In 2014, Huang et al. successfully isolated six fungi from the species Sinopodophyllum hexandrum (Royle) . One fungal strain named TW5 was able to produce two metabolites, namely, kaempferol and podophyllotoxin. The yield of the latter compound was 49.3 μg/g of mycelia dry weight after 7 days of fermentation. The fungal endophyte Pestalotiopsis fici was isolated from branches of Camellia sinensis (L.) Kuntze grown in China. Seven new isoprenylated chromone derivatives, namely, pestaloficiols F-L were isolated. Among the new compounds, pestaloficiol J, K, and L exhibited cytotoxicity with IC50 values ranging between 8.7 and 99.3 μM for HeLa cell line . Recently a study conducted by Katoch et al. (2018) isolated 27 endophytes from the plant species Viola odorata Linn. and the endophytes were evaluated for lipase inhibitory activity which results in an IC50 of <10 μg/mL . It is reported that the extracts of Aspergillus sp. exhibited promising lipase activity with an IC50 value of 3.8 μg/mL. Interestingly, endophytic fungi also have the ability to increase the yield of key natural products by producing gene products that are responsible for inducing metabolites production. For instance, the genomic analysis of the fungus Aspergillus nidulans revealed the expression of terrequinone A which was further reported to generate up to 27 polyketides, 14 non-ribosomal peptides, one terpene, as well as two indole alkaloids . Thus, realizing the capability of terrestrial endophytic fungi to produce diverse bioactive molecules, research is underway to isolate and screen microbes of diverse habitats and unique environment for discovery of novel metabolites. One such unexplored and less-studied microorganisms are the marine endophytic fungi [1, 56]. The marine environment is an extremely diverse reservoir of life, and across the range of organisms, there is a virtually untapped source of structurally unique natural products [57, 58, 59]. About 70% of earth’s surface is covered with water and it comprises 500,000 live species divided into 30 different phyla. The oceans world over have a coastline of about 312,000 km and a volume of 137 km3 × 106 km3 making it the largest ecosystem on earth . Marine-derived fungi, which are obtained from various marine substrates such as fish, sponges, mangroves, and algae, has attracted considerable attention from chemists due to their outstanding capacities to produce active metabolites with pertinent biological activities [37, 59, 61, 62]. It is statistically reported that among the 272 new compounds discovered from marine-derived fungi till 2002, 85% of them are produced by epi/endophytes . Nevertheless, the first marine-derived product to gain approval as a drug was ziconotide, a non-narcotic analgesic isolated from the cone snail genus Conus, which is currently marketed as Prialt® . Ziconotide works by binding to N-type calcium channels to block pain signal transmission to the brain through nerve cells in the spinal cord . It is used to alleviate neuropathic pain associated with cancer and AIDS and also as systemic analgesics adjunctive therapies or intrathecal morphine [64, 65]. Since then, many clinical trials are being conducted by the marine preclinical pharmaceutical pipeline on several marine-derived metabolites (Table 1). Although terrestrial fungi have an extraordinary diversity of life, the greatest biodiversity is in the oceans particularly in the deep sea floor and coral reefs with 34 out of 36 phyla of life represented . The genetic and metabolic diversity of marine fungi is reflected by their particular living conditions, salinity, nutrition, higher pressure, temperature variations, and competition with bacteria, viruses, and other fungi to which they have to adapt themselves during their evolution . In addition, marine fungi live in close association with soft-bodied marine organisms (algae, seaweeds, and sponges) which lack obvious structural defense mechanisms, thus relying on chemical defense through production of bioactive secondary metabolites, either by themselves or by associated microflora, to survive in their extreme habitat [70, 71]. Consequently, marine-derived fungi have been recognized as resources for new biologically active secondary metabolites . The emergence of multidrug resistant bacteria, the insufficient number of effective antibiotics against diverse bacterial species, and the urgent need to eradicate the problem of infectious diseases (IDs) and noncommunicable diseases (NCDs) has inspired researchers to discover novel compounds from endophytes [60, 73]. A new polyoxygenated decalin derivative, dehydroxychlorofusareilin B, obtained from extracts of Aspergillus species (family Trichocomaceae) which was isolated from the marine brown algae Sargassum horneri in Korea, was found to exhibit mild antibacterial activity against Staphylococcus aureus (S. aureus), methicillin-resistant S. aureus (MRSA), and multidrug-resistant S. aureus . Usually, structural compounds obtained from endophytes associated with brown algae are naphto and pyrone derivatives presenting antifungal and antioxidant activity, macrolides, and bicyclic lactones showing antimicrobial and antioxidant potential as well as cytotoxic ergosterolide derivates with an unusual pentalactone B-ring . As an illustration, the marine fungi Pestalotia sp. and Penicillium glabrum isolated from the surface of the brown algae Rosenvingea sp. and Sargassum thunbergii, respectively, was able to produce antimicrobial substances with potent antibiotic activity . When Pestalotia sp. was cultured in the presence of a bacterial antagonist, the fungus produced the potent antibiotic pestalone, which showed an MIC value of 37 ng/mL against MRSA and an MIC value of 78 ng/mL against vancomycin-resistant Enterococcus faecium (VREF) . Jiang et al. (2018) recently isolated the endogenous fungus Penicillium sp. GD6 of the mangrove Bruguiera gymnorhiza (L.) Lam . A compound 2-deoxy-sohirnone C was isolated from the fungus and tested against S. aureus resulting in an MIC value of 80 μg/mL. Another mangrove-derived fungus is Penicillium citrinum HL-5126 isolated from the species Bruguiera sexangula var. rhynchopetala. A novel chlorinated metabolite 20-acetoxy-7-chlorocitreorosein was identified from the ethyl acetate extract of the fungi and tested against Vibrio parahaemolyticus resulting with a MIC value of 10 μM . Endophytic fungi and the labyrinthulid Aplanochytrium minutum were also successfully isolated from Sargassum cinereum and Padina tetrastomatica . Extracts of Fasciatispora nypae, a marine fungus isolated from Mangrove plant, had the widest range of antimicrobial activity against Bacillus subtilis, Candida albicans, Escherichia coli (E.coli), Staphylococcus aureus, Saccharomyces cerevisiae, and Schizosaccharomyces pombe . The salt water culture of an unidentified fungus obtained from a Haliclona sp. sponge was shown to produce several new hirsutane sesquiterpenes hirsutanols A and ent-gloeosteretriol which exhibited mild antibiotic activity against Bacillus subtilis. Hirsutanols were previously isolated from the terrestrial fungus Coriolus consors, but a seawater-based culture of C. consors produced hirsutanol D demonstrating that the use of seawater with terrestrial fungi can yield new metabolites . Penicilactone, obtained from extracts of Penicillium sp. isolated from Annella sea fan species exhibited potent antifungal and antibacterial activity against Microsporum gypseum and MRSA with MIC values of 228.57 mM and >700 mM, respectively . Marine fungi belonging to the genus Aspergillus, Pencillium, and Fusarium, isolated from mangrove forest were tested for antibacterial activity with E. coli, Klebsiella pneumoniae and Pseudomonas aeruginosa and for anti-mycobacterial activity against Mycobacterium tuberculosis H37 RV. These fungal compounds showed best antibacterial and antimycobacterial activities when extracted with n-hexane, methanol, and ethyl acetate . The endophytic Chloridium sp. isolated from the surface-treated root tissues of Azadirachta indica A. Juss was reported to have promising antibacterial activity against E.coli and Bacillus sp. with the production of a highly functionalized naphthaquinone javanicin . A marine fungus, Xylaria psidii KT30, isolated from the red seaweed, Kappaphycus alvarezii, exhibited significant antibacterial activities against Bacillus subtilis and S. aureus with the respective inhibition zones of 8 ± 0.57 mm and 7 ± 0.57 mm . successfully isolated Cladosporium cladosporioides from the seaweed, Sargassum wightii . This compound proved to be a potential candidate for future cost-effective antimicrobial treatment. The aqueous extract (50 mg/mL) showed inhibition activity against S. aureus, S. epidermidis, Bacillus subtilis, E. coli, and Aspergillus niger with inhibition zones of 6.5 ± 0.11, 5.0 ± 0.50, 6.0 ± 0.90, 3.0 ± 0.10, and 3.0 ± 0.10 mm, respectively. Recent studies described cultivable fungal community associated with jellyfish, Nemopilema nomurai. Yue et al. (2015) findings reported a total of seven morphotypes isolated, which were assigned into four genera Aspergillus, Cladosporium, Purpureocillium, and Tilletiopsis from two main phyla (Ascomycota and Basidiomycota) . Ethyl acetate was used as solvent for the antimicrobial assays. The antimicrobial results showed that all of the 13 EtOAc extracts displayed different levels of antibacterial activity, three extracts from the genera Aspergillus, Tilletiopsis, and Cladosporium of which exhibited strong to significant antibacterial activity to the bacterial pathogens Staphylococcus aureus and Salmonella enterica. Green algae are known to have a high fungal colonizing rate and are promising sources for bioactive compounds. For instance, a novel polyketide ascosalipyrrolidinone-A was isolated from the marine fungus Ascochyta salicornia associated with the green marine alga Ulva species. This compound was reported to possess antiplasmodial activity and thus could be used in treating Malaria . Metabolites isolated from endophytes derived from marine green algae usually possess bicyclical structures with oxygen and aromatic rings demonstrating cytotoxicity, antiprotozoal, and antimicrobial activities . Fermentation of Ascochyta salicornia, an obligate marine fungus associated with green algae Ulva sp., resulted in the production of a diverse array of metabolites including two new unusual tetramic acid derivatives ascosalipyrrolidinones A and B, as well as the new pyrone ascosalipyrone. Ascosalipyrrolidinone A displayed antiplasmodial activity against Plasmodium falciparum, antimicrobial activity, and also inhibited the tyrosine kinase p56 . The polyketide citrinin, produced by Penicillium janthinellum a fungus from the fruit of Melia azedarach, was found to inhibit 100% Leishmania mexicana at a concentration of 40 μg/mL . Extracts of Aspergillus niger isolated from the marine brown alga Colpomenia sinuosa, synthesised Asperamide A, a sphingolipid which displayed activity against Candida albicans. Additionally, two novel cyclic hexapeptides containing both anthranilic acid and dehydroamino acid units, sclerotides A and B were isolated from the marine-derived halotolerant Aspergillus sclerotiorum and showed antifungal and antibacterial activity . The endangered tree Torreya taxifolia harbored Pestalotiopsis microspora which exhibit antifungal activity associated with pestaloside, an aromatic glucoside, and two pyrones: pestalopyrone and hydroxypestalopyrone . Penicillium sp. from marine sea fan yielded the macrolide (+)-brefeldin which showed antifungal activity against Microsporum gypseum with MIC value of 228.57 mM . Bostrychia tenella (family Ceramiales), a Brazilian marine seaweed harbored about 45 endophytic microorganisms, were evaluated for their antifungal properties showing positive activities . Cytonic A and B are two novel compounds, recently isolated from Cytonaema sp. and were reported to be novel human cytomegalovirus protease inhibitors. Hinnuliquinone was also isolated from an EF inhabiting the leaves of Oak trees. It was identified as being a potent inhibitor of HIV-1 protease . An endophytic fungus Pestalotiopsis theae of an unidentified tree on Jianfeng Mountain, China, was capable of producing Pestalotheol C with anti-HIV properties . Interestingly, Liu et al. (2017) isolated seven compounds from the endophyte Treptomyces sp. OUCMDZ-3434 from green algae, Enteromorpha prolifera among which three of them, namely, ailupemycin J, R-, and S-wailupemycin K and 5-deoxyenterocin showed moderate anti-H1N1 activity with percentage inhibition 47.8%, 42.5%, and 60.6% at 50 μg/mL . As part of the ongoing efforts towards finding novel antioxidants from natural resources, fungal endophytes were investigated to be potential sources of antioxidants . The momentousness of compounds bearing antioxidant activity lays in the fact that they are highly effective against damage caused by reactive oxygen species (ROSs) and oxygen-derived free radicals, which contribute to a variety of pathological effects . The anti-inflammatory, anti-mutagenic, antiviral and anti-artherosclerotic activities of antioxidants have been offering propitious therapy for prevention and treatment of ROS-associated diseases as cancer, cardiovascular diseases, diabetes mellitus, Alzheimer, and Pakinson diseases . Penicillium roquefortii, Aspergillus candidus, Mortierella sp., and Emericella falconensis are known to be producers of natural antioxidants. Extracts of Acremonium sp. were recently analyzed and were found to produce two novel hydroquinone derivatives which showed significant antioxidant activity . Extracts from South Indian green alga Ulva reticulata were found to have neuroprotective effects by inhibiting both acetyl and butyrylcholinesterases. They were compared to agents currently approved for Alzheimer’s disease treatment and were found to be very potent . The marine fungus Halorosellinia oceanica was isolated from Mai Po mangrove in Hong Kong and produced a new sesquiterpenoid which displayed a unique mechanism of bio-oxidation by biotransforming 1, 2, 3, 4-tetrathydronaphthalene into four oxidative products without disrupting the activated alicyclic skeleton . A novel isocoumarin, desmethyldichlorodiaportintone was isolated from the endophytic fungus Ascomycota sp. CYSK-4 originating from a mangrove plant, Pluchea indica (L.) Less. The compound was evaluated for its anti-inflammatory property and displayed IC50 value of 15.8 μM against nitric oxide production in LPS-induced RAW 264.7 cells . Polysaccharides obtained from the marine fungus Penicillium sp. showed significant antioxidant properties against superoxide and hydroxyl radicals . Curvularia tuberculata, an algicolous marine fungus exhibited good antioxidant properties with 62.15% of inhibition in total reducing power assay and 11.69% of inhibition in hydroxyl radical scavenging assay . Moderate radical scavenging activity was observed with chaetopyranin, isotetrahydroauroglaucin, and erythroglaucin which are benzaldehyde secondary metabolites produced by the endophytic fungi Chaetomium globosum, isolated from the inner tissue of the marine red alga Polysiphonia urceolata . Parasitenone was produced by the marine fungus Aspergillus parasiticus and possessed free radical scavenging activity. This fungus was isolated from the red alga Carpopeltis cornea . Pyrenocine A, produced by the marine-derived fungus Penicillium paxilli was recently found to possess anti-inflammatory activity . Anti-inflammatory activity of extracts is often associated with polyphenols metabolites. For instance, in-vivo anti-inflammatory activity which resulted in significant inhibition of asthmatic reactions was observed in polyphenolic extracts from red algae Laurencia undulata. Additionally, the antioxidant activity in phenolic compounds from the marine algae Halimeda monile and Porphyra haitanensis indicate the potent sources for isolation of metabolites from endophytes . Plants are also screened for antioxidant compounds derived from endophytic fungi, since the discovery of pestacin and isopestacin, isolated from Pestalotiopsis microspore, residing in Terminalia morobensis. Similarly, phenolic acids and flavonoids have been isolated from endophytic fungi. For instance, extracts of Xylaria sp. from Ginkgo biloba exhibited strong antioxidant activity [73, 84]. Recently Liu et al. (2018) isolated the fungus Ascomycota sp. SK2YWS-L endogenous to the mangrove plant Kandelia candel . The fungus produced the enantiomers (+)- and (−)-ascomindone D that were known to possess potential anti-inflammatory properties with IC50 values of 17.0 and 17.1 μM, respectively. According to the World Health Organization (WHO) Global Burden of Disease report in the year 2004, cancers occupied the third place on the list of deadliest diseases in the world . It is crucial to find curative measures which hold no loopholes and act accurately and precisely to curb cancer . The leptosin family of dimeric diketopiperazines is the largest classes of cytotoxic fungal metabolites. The producing fungus, Leptosphaeria sp., was isolated from the marine alga Sargassum tortile and produced lepsosins which exert antitumor activity . Extracts of endophytic fungi isolated from Sargassum sp. yielded two ring lactones among which Lasidiplodin displayed strong anti-leukemic and potato microtuber-inducing activities . Makaluvamine A is a pyrroloquinoline, principally isolated from the sponge Zyzzya fuliginosa and is known to have potent anticancer activity via inhibiting topoisomerase II which is important for DNA replication . Several classes of terpenes, diterpenes, monoterpenes, and polyoxygenated compounds with antibacterial, antifungal, and anticancer properties have been discovered from endophytes isolated from red algae . As example, the diterpene compound (+)-epiepoxydon with activity against human cancer cell lines was obtained from the fungal extracts of Apiospora montagnei isolated from the red alga Polysiphonia violacea . Anti-cancer alkaloids were also derived from Penicillium citrinum extracts isolated from the red alga Actinotrichia fragilis . Endophytes isolated from green algae are promising sources of cytotoxic compounds. Fusarium sp. isolated from the green alga Codium fragile produced tetrapeptide anticancer metabolite . Chemical analysis of the fungus Aspergillus versicolor, isolated from the green alga Penicillus capitalus, revealed the presence of four new sesquiterpenoid nitrobenzoyl esters belonging to the cinnamolide class of drimane sesquiterpenes. These compounds were responsible of all the HCT-116 colon carcinoma cell cytotoxicity . Verrucarin A, a compound isolated from the broth of marine fungus Myrothecium roridum, was investigated to significantly inhibit interleukin-8 production from human leukemia cells by a mechanism that involved inhibition of the activation of the mitogen-activated kinases c-JUN and p38 . Recently, in a study conducted by Rajivgandhi et al. (2018), an endophytic actinomycete identified as Streptomyces coeruleorubidus GRG 4 (KY457708) was found to possess potential cytotoxic activity against A549 lung cancer cells . This result was linked to the chemical compound, Bis (2-ethylhexyl) phthalate (BEP), isolated from the strain. The cytotoxic test of the isolated compound showed complete inhibition against the cancer cells at 100 μg/ml during 24 h treatment. Five new phenolic polyketides, namely, 3-O-methylwailupemycin G (1), wailupemycin J (2), R- and S-wailupemycin K (3 and 4), and wailupemycin L (5) and two known compounds, enterocin and 5-deoxyenterocin, were identified in the endophyte Streptomyces sp. OUCMDZ-3434 cohabitating the green algae, Enteromorpha prolifera. Results showed that compound (4) exhibited cytotoxic activity on the HeLa cell with IC50 of 8.2 μM . The endophytic fungal strain was isolated from the roots of the mangrove plant Excoecaria agallocha (Euphorbiaceae) growing in Wenchang, Hainan, China. The compounds were evaluated for their cytotoxicity against A549 and HL-60 cell lines. Compound 56 exhibited moderate cytotoxic activity against HL-60 cell line with an IC50 value of 15.7 μM, while 57 showed pronounced activity against both cell lines with IC50 values of 1.9 and 5.4 μM, respectively . Chemical investigation of the mangrove-derived endophytic fungus Fusarium sp., isolated from fresh stems of the mangrove tree Kandelia candel (Rhizophoraceae), yielded a new isoflavone, 5-O-methyl-2′-methoxy-3′-methylalpinumisoflavone (60), together with four known compounds. Compound 60 was tested for its cytotoxic activity against HEp-2 and HepG2 cell lines. The compound inhibited the growth of both cancer cell lines with IC50 values of 4 and 11 μM, respectively . Furthermore, the endophyte Diaporthe phaseolorum SKS019 was isolated from the mangrove plant Acanthus ilicifolius L. Through phytochemical screening, the compound 5-deoxybostrycoidin was identified and subjected to cytotoxic screening. Indeed the compound showed good activity against the human cancer cell lines, namely, MDA-MB-435 and NCI-H460 with IC50 values of 5.32 and 6.57 μM, respectively . Cultures of Chaetomium globosum isolated from the marine green alga Ulva pertusa (Ulvaceae) collected at the Qingdao coastline, China, yielded seven new cytochalasan derivatives, cytoglobosins A–G (61–67). The cytotoxicity of cytoglobosins A–E and G (61–65 and 67) was evaluated against P388, A549, and KB cancer cell lines, where only cytoglobosins C (63) and D (64) exhibited cytotoxic activity toward the A549 cancer cell line with IC50 values of 2.26 and 2.55 μM, respectively, whereas the remaining compounds showed no activity (IC50 >10 μM). Chemical investigation of Aspergillus ochraceus, isolated from the marine brown alga Sargassum kjellmanianum (Sargassaceae), afforded a rare 7-nor-ergosteroid possessing an unusual pentalactone B-ring system, 7-nor-ergosterolide (68). The compounds were tested for their cytotoxic activities against NCI-H460, SMMC-7721, SW1990, DU145, HepG2, Hela, and MCF-7 cancer cell lines. Compound 68 showed selective cytotoxic activity against the NCI-H460, SMMC-7721, and SW1990 human cancer cell lines with IC50 values of 12.0, 16.9, and 67.6 μM, respectively. Mohamed et al. (2009) reported on a new group of natural products isolated from a marine-derived fungal strain classified as a Phoma sp., which was isolated from the Caribbean marine sponge Ectyplasia perox (Raspailiidae) . The compounds isolated include the new epoxyphomalins, namely, epoxyphomalin C (77), D (78), and E (79), together with the known congeners epoxyphomalins A and B. The cytotoxicity of compounds 77–79 was investigated using a monolayer cell survival and proliferation assay and a panel of 36 human tumor cell lines. D (78) exhibited a mean IC50 value of 6.12 μM and showed selectivity toward PC3M (IC50 = 0.72 μM) and BXF 1218 L (IC50 = 1.43 μM) tumor cell lines . Spartinoxide (97), an enantiomer of the known compound A82775C (98), was isolated from marine-derived Phaeosphaeria spartinae, together with two known metabolites. The fungal strain was isolated from an algal sample belonging to the genus Ceramium (Ceramiaceae) which was collected from the North Sea, Büsum, Germany. When tested against the enzymes human leukocyte elastase (HLE), trypsin, acetylcholinesterase, and cholesterolesterase, Spartinoxide (97) and the known 4-hydroxy-3-prenyl-benzoic acid (99) showed potent inhibition of HLE with IC50 values of 6.5 and 8.1 μM, respectively. HLE is involved in the migration of neutrophiles from blood to tissues, and its excessive activity may cause diseases such as pulmonary emphysema, rheumatoid arthritis, and cystic fibrosis . In 2013, Teiten et al. reported that altersolanol A, a natural anthraquinone derivative originally isolated from the endophytic fungus Stemphylium globuliferum, showed cytotoxic, cytostatic, anti-inflammatory, and anti-migrative activity against human cancer cell lines (chronic myeloid K562 leukemia and A549 lung cancer cells) in a dose-dependent manner . Interestingly, this compound did not affect the viability of noncancerous cells. Results clearly demonstrated that altersolanol A induces cell death by apoptosis through the cleavage of caspase-3 and -9, and through the decrease of antiapoptotic protein expression. Acetylation of altersolanol A did not improve activity, whereas other altersolanol derivatives such as tetrahydroaltersolanol B and ampelanol (one of the carbonyl group reduced and some hydroxyl substituents removed) were inactive in comparison. Alterporriol L, a new bianthraquinone derivative, was isolated from endophytic marine fungus Alternaria sp. ZJ9-6B . The fungus was isolated from the mangroves fruits and the extracts were tested for their cytotoxic activity and anticancer mechanisms for breast cancer cells lines. Moreover, the alterporriol L could induce cancer cell apoptosis or necrosis, through the destruction of the mitochondria confirmed the positive effect of the extracts, thus a new potential tool against cancer. The World Health Organization reported that there are 387 million people living with diabetes worldwide in 2014, and the number would increase to 592 million in 2035 (IDF, 6th Ed). In the past decade, several research groups have focused on the exploration of new bioactive metabolites from mangrove endophytic fungi collected from the South China. Recently, a chemical investigation of the mangrove-derived fungus Aspergillus sp. 16-5B, from the leaves of Sonneratia apetala, had led to the isolation and characterization of four new compounds. All compounds were evaluated for their α-glucosidase inhibitory activities. Details of the isolation, structural elucidation, as well as evaluation of the biological activity of these compounds are reported herein. Chemical investigation of Aspergillus sp. 16-5B, a marine endophytic fungus isolated from the leaves of Sonneratia apetala, led to the discovery of six compounds (1–6), including new compound aspergifuranone (1), two new pairs of enantiomers of isocoumarin derivatives (±) 2 and (±) 3, (R)-3- demethylpurpurester A (4) and pestaphthalides A (6). Compounds 1, 2, and 6 exhibited more potent inhibitory effects against α-glucosidase activity than the clinical α-glucosidase inhibitor acarbose. The phenolic polyketide, 3-O-methylwailupemycin G, isolated from Streptomyces sp. OUCMDZ-3434 of the green algae Enteromorpha prolifera showed good activity with IC50 value 0.86 mM compared to the positive control, acarbose with IC50 1.12 mM . The endophytic fungus Aspergillus versicolor SYSU-SKS025 endogenous to the mangrove species Excoecaria agallocha L. produced the metabolite 7-deoxy-7, 14-didehydrosydonol. The latter exhibited significant activity against α-glucosidase resulting with an IC50 value of 12.5 μg/mL . One new isopimarane diterpene (1), together with two known compounds, 11-deoxydiaporthein A (2) and iso-pimara-8(14),15-diene (3) were isolated from the culture of Epicoccum sp., which was associated with Apostichopus japonicus. In the bioactivity assay, both Compounds 1 and 2 exhibited α-glucosidase inhibitory activity with IC50 values of 4.6 ± 0.1 and 11.9 ± 0.4 μM, respectively. Aquastatin A is a novel therapy for type II diabetes and obesity. It has been produced by the endophytic fungi Cosmospora sp. collected at inter-tidal sediment. It competitively and selectively inhibits protein tyrosine phosphatases which are a group of enzymes responsible for modulating tyrosine phosphorylation-dependent cellular events . Insulin mimetic was isolated from the endophytic fungus Pseudomassaria sp., which resides in an African rainforest. This new insulin mimetic had the advantage of lowering blood glucose level without being destroyed in the digestive tract and can thus be considered as a new therapy for diabetes . EF isolated from terrestrial or marine plants are thus renowned to produce secondary metabolites of various activities (Table 2). Marine-derived fungi are an important source of secondary metabolites that can possess both unique structure and potent pharmaceutical activity. Three new alkaloids, brocaeloids A–C (1–3), containing C-2 reversed prenylation, were isolated from cultures of Penicillium brocae MA-192, an endophytic fungus obtained from the fresh leaves of the marine mangrove plant Avicennia marina. Brocaeloid B (2) showed lethality against brine shrimp (Artemia salina) with an LD50 value of 36.7 μM. There is a need to bring marine-derived drugs from the ocean to the pharmacy. The search for potential drugs derived from marine organisms should continue to tap more natural sources of medicinal compounds. Marine-derived endophytic fungi, as a novel and abundant microorganism resource owing to its special ability to produce similar compounds as that of their hosts, as well as other bioactive compounds, have been the focus of interest which have led to important drugs available from the pharmaceutical industry such as Prialt®, Yondelis®, Aplidin®, and Irvalec®. The preceding sections have highlighted the existing possibilities for exploiting endophytic fungi for the production of a plethora of known and novel bioactive metabolites. There is great opportunity to find reliable and novel pharmaceutical leads in endophytic fungi which could be used to alleviate CDs and NCDs, especially those isolated from marine sources. As elaborated along the length of this review article, results from many studies corroborated with countless endophytic species showing that marine organisms represent a potential platform for future pharmaceutical development. As presented in Table 1, there are some drugs under clinical development and a few have been approved as potential cancer drugs namely cytarabin Ara-C, Yondelis®, and trabectedin. However questions are still being raised concerning the sustainable use of fungi to extract potential drugs for medical use. And the major problem facing the future of endophytes is the decrease of rainforest and the limited amounts of biomass of most marine invertebrates available from wild stocks [27, 60]. A decrease in biodiversity certainly means a decrease in potential drugs. There is also a need to investigate cultural conditions of these fungi so that they can be grown in vitro and the potential to enable them to produce specific metabolites are maximized. Furthermore, there is a need to call for expertise of talented synthetic chemists, taxonomists, and pharmacologists who have the ability to explore structures to their full potential in order to optimize their ADME properties for future drug use [55, 60]. There is also a need to assess whether the beneficial medical properties of these compounds derived from these endophytes are substantiated. Although marine endophytes are potential sources of medicinal products, it is noteworthy to point out that any minute amount of derived product might contain a diverse array of chemicals that can contribute to other harmful side effects in humans. Which specific ones are really important, what are their mechanisms of action, and how do they interact with multiple molecular targets are questions that warrant further investigations. While there is a rush to adopt natural compounds for safety reasons, one needs to identify what are the levels of risks of other adverse effects compared to synthetic pharmaceuticals. Proper pharmacological evaluations of active ingredients need to be carried out. The methods of extraction and characterization of metabolites on a large scale and at reasonable cost also need further studies. Studies should focus on improving methods and clinical research on human subjects with more scientifically accurate experiments so that the effectiveness of these natural products can be assessed.